What Can We Learn about Leadership from Moses? In this text study, Zvi Grumet explores incidents in Moses’ life and extrapolates his approach to leadership. Presented as part of the Global Day of Jewish Learning. 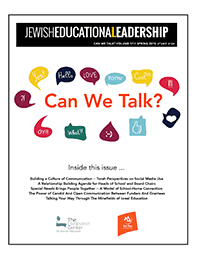 Rabbi Zvi Grumet is the Associate Educational Director at The Lookstein Center and the editor of Jewish Educational Leadership. He is also chair of the Tanakh department at Yeshivat Eretz Hatzvi, and is on the faculty for the Pardes Educators’ Program and at Hebrew College in Boston.